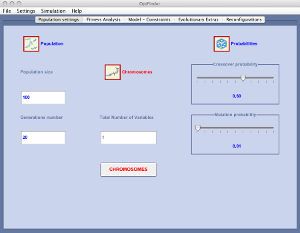 Software for computer simulations of genetic populations. Genetic algorithms are one of the methods for search and optimisation. To learn more about genetic algorithms go to genetic algorithms page. The OptFinder software is written in Java and can be run on various operating systems. This numerical package is designed for Java(TM) SE Runtime Environment version 8. If you want to test this product: Go To Log In Page. OptFinder and its documentation is available from user's account. If you do not have an account: Create Account. The table below presents available program options. At the very beginning, an user should decide which type of genotype is going to use in simulation. There are two possible options: haploid genotype or diploid genotype. The difference between them is that haploid genotype consists of single chromosomes whereas diploid genotype is built from pairs of chromosomes. The next important parameter set in simulation is the fitness function. The fitness function is the essential measure of chromosome strength to occur in the next generation. One can try to scale the fitness function according to linear or other available rules (listed in the table below). When a problem to solve is more complicated and involves any type of constraints then genetic algorithms can deal with it as well. It is done by the punishment function. It constitutes a penalty that is added/subtracted to/from the aim function when any of constraints is violated. Having the population generated and fitness factors computed for every chromosome in the population, a group of parents of next generation can be chosen. A selection mechanism is based on the one main rule the better fitness the greater reproduction (more children). Thus, reproduction in population is thought as a randomised process based on the fitness function. In simulation, the user can choose a selection mechanism from selection methods listed in the table. In haploid models, a pair of chromosomes is a pair of parents that exchange their genetic information through the crossover process whereas, in diploid models, the process of gametogenesis uses the crossover mechanism to exchange genetic information between gametes. In spite of that small difference between haploid and diploid models in both cases it is demanded to find the crossover point or points (in models with multiply crossovers) on two parent chromosomes with assumed crossover probability. In genetic algorithms simulation, genetic information can be also modified through mutations. They are random events and occur with assumed mutation probability. Moreover, when chromosomes have more than one gene allele location on a chromosome might not be constant. It can be changed by the process called genetic reconfiguration. It is done to enhance genetic variability of newly created population. The table below presents main types of genetic reconfigurations that can be used in simulations. Multi-parametric problems are represented by vector functions and in such cases the Pareto Approach should be used. 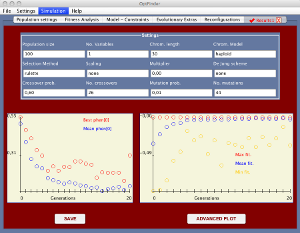 The Optfinder software allows to deal with multi-parametric problems.